The Canadian Foodgrains Bank is a partnership organization (in 2013) of 15 Canadian Christian church agencies representing 32 denominations working to end world hunger. It provides food assistance where there is an immediate need, food security by helping communities to help themselves through improved agricultural techniques, and assists families with improved nutrition. It began in Winnipeg, Manitoba in 1975 as the Mennonite Food Bank, a partner organization of Mennonite Central Committee Canada. It expanded in 1983 when four other church denominations joined its work, and became the Canadian Foodgrains Bank. In addition, since 1983 the Foodgrains Bank has been financially assisted by the Canadian International Development Agency (CIDA). Through CIDA, Bank members were able to leverage donations on a four-to-one basis for food assistance in the developing world up to an annual maximum of $25 million (in 2013). In its first 30 years it has provided over 1.1 million tonnes of food and seeds, worth over 682 million Canadian dollars in 78 different countries. In the 2011/12 fiscal year it provided assistance to over 1.1 million people. Food distribution at Madaoua, Niger. Source: Canadian Foodgrains Bank website. In 1974 the price of grains worldwide increased dramatically. While this benefited farmers, for the hungry it was often fatal. Art DeFehr, a member of Winnipeg’s River East Mennonite Brethren Church and a Winnipeg businessman who had recently returned from a Mennonite Central Committee (MCC) assignment in Bangladesh, was concerned because he had witnessed huge food shortages in Bangladesh linked with a complete inability to get food aid from the major Western countries. Upon his return to Winnipeg, DeFehr joined informal meetings with concerned individuals, including MCC colleague John Wieler, Len Siemens, the associate dean of agriculture at the University of Manitoba, and David Durksen, head of agro-information for Federal Grain Company. This group developed a response to the Hillsboro Resolution passed in January 1974 at the MCC annual meeting. That Resolution called upon the Mennonite community to develop mechanisms to respond to emergency food shortages in the world. The foursome adopted the Biblical Joseph principle as their guide—the concept of banking grain and resources in years of plenty for distribution when times were lean (Genesis 41). Mennonites had a strong agricultural base; many had experienced hunger in the early Soviet Union or during World War II before settling in Canada. Most felt a Christian duty to feed the hungry, and international service with MCC gave many Mennonites a personal connection to food needs worldwide. DeFehr produced a draft proposal for a food aid banking system that the MCC executive in Canada accepted in September 1975. The first planning meeting was held on 28 October. DeFehr became chair of the first interim board of the agency known as the Mennonite Food Bank; John R. Dyck joined as the first Executive Director. Negotiations with the Canadian Wheat Board (CWB) and the Canadian International Development Agency (CIDA) took a frustrating two years. The Mennonite Food Bank was established as a separate organization from MCC Canada, but MCC handled the Bank's overseas distribution. In October 1976 it launched its first appeal for wheat to western Canadian farmers, resulting in donations of 1,442 tonnes. This total was well below expectations, but 600 tonnes of wheat were sent to India. In 1979 Bert Loewen became the Mennonite Food Bank’s Executive Director. He negotiated with the Canadian Wheat Board to allow farmers to deliver outside of their quota set by the CWB. In 1979 the Mennonite Food Bank expanded and began to include participation from other Christian denominations. In November 1982 ten Christian agencies met to plan an expanded inter-church food agency. This led to an organizational meeting in Winnipeg in May 1983 to launch and incorporate the Canadian Foodgrains Bank Association, with formal commitments from five Church agencies--Baptist Federation of Canada Relief and Development Committee, Canadian Lutheran World Relief, Christian and Missionary Alliance, Christian Reformed World Relief Committee, and the Mennonite Central Committee. Its headquarters was located on Smith Street in Winnipeg, Manitoba. After debate over its structure, the Canadian Foodgrains Bank evolved into a bank in the true sense of the word, allowing each member agency to maintain its own account and draw on matching CIDA contributions. Each member agency worked with its own partners in recipient countries to deliver food aid and development projects. 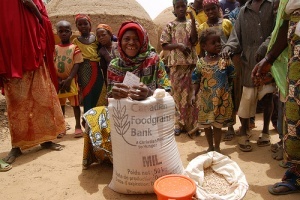 The Canadian Foodgrains Bank has provided food assistance in each year of its existence. In emergency circumstances food shipments often doubled, as in the 1984/85 Ethiopian famine, the 1991-1994 Southern African drought, or the 2011/12 East Africa famine. North Korea became a special case because of its political isolation. In 1995 a serious food emergency unfolded in North Korea, in part because of the collapse of the Soviet Union. Foodgrains member churches decided a major food response was necessary. Initially the Canadian government did not want CIDA’s matching funds to be used. The churches decided to respond without government support and purchased 4,350 tonnes of rice in the region in 1996/97. Once the seriousness of the food crisis became widely recognized, the government allowed CIDA funds to be used. The following year, Foodgrains provided over 23,000 tonnes of Canadian wheat as part of a global effort that helped avert a North Korean famine. 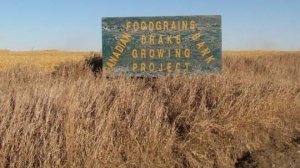 Drake, Saskatchewan Foodgrains Bank sign. Photo by Victor Wiebe. Many Mennonite communities have actively promoted special fundraising events for the Canadian Foodgrains Bank. For example, from 1998 to 2010 Mennonites and others of Drake, Saskatchewan, a small rural community of about 200 people raised over $242,000 for the Canadian Foodgrains Bank. Canadian Foodgrains Bank. A Christian Response to Hunger: The First 20 Years – Key People and Events. [Winnipeg, Manitoba], 2003, 28 pp. Wiebe, Victor G. "Canadian Foodgrains Bank (Winnipeg, Manitoba, Canada)." Global Anabaptist Mennonite Encyclopedia Online. February 2013. Web. 25 Apr 2019. http://gameo.org/index.php?title=Canadian_Foodgrains_Bank_(Winnipeg,_Manitoba,_Canada)&oldid=139878. Wiebe, Victor G. (February 2013). Canadian Foodgrains Bank (Winnipeg, Manitoba, Canada). Global Anabaptist Mennonite Encyclopedia Online. Retrieved 25 April 2019, from http://gameo.org/index.php?title=Canadian_Foodgrains_Bank_(Winnipeg,_Manitoba,_Canada)&oldid=139878.